Zoho is a company dedicated to creating smart cloud solutions for various business problems. It has come a long way since it launched its first two cloud business apps in 2005. Since then, it has developed a full suite of excellent software that makes it easier for small and medium business owners to manage their customer relationships, email correspondence, finances, sales and marketing, and so much more. In this Zoho Books review, we focus on Zoho’s cloud accounting solution, which offers a range of useful accounting tools at rather good prices. 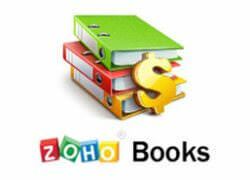 Zoho Books is online accounting software designed to facilitate, organize, and automate finance-related tasks. It allows you to store and manipulate all the relevant data in a single, clear, easily navigable environment. The software boasts great versatility and customizability. It facilitates contact management, time tracking, online payment management, invoicing, inventory tracking, expense tracking, handling purchase and sales orders, tax preparation, and a variety of other financial and accounting tasks. It can be easily integrated with other Zoho products (Zoho CRM, Zoho Inventory, Expense, Zoho Subscriptions, Zoho Projects, and Zoho Reports), which can further simplify business management processes. Apart from the basic, online version of the software, which you can access and use straight from your browser, you can opt for Zoho Books apps compatible with Windows, Android, and iOS and take your accounting software with you wherever you go. Is Zoho Books Right For You? The main goal of Zoho Books is to make accounting less stressful for freelancers and small business owners. Its key advantage is that it offers powerful tools that you can learn how to use within just several hours. It is more user-friendly than many other solutions of its kind, which makes it suitable even for users who have no previous experience with this sort of software. Thus, if you fall into one of the two user categories listed at the beginning of this paragraph and seek an easier way to manage your finances, Zoho Books can be a rather good choice for you. If you are an accountant looking for further professional development and a sure way to get more clients, Zoho Books is here to help. You can register for the Zoho Books advisors program, attend the free one-hour webinar, and become one of the esteemed Zoho Books advisors. Once you are a part of the team, you get to use Zoho Books for free and get training materials and attend webinars that can turn you into an advanced user of Zoho Books in very little time. As a Zoho Books advisor, you get to be featured in the company’s accountant directory available to a large number of Zoho users in search of a good accounting expert. Furthermore, you get to attend Zoho’s yearly Zoholics Finance events and regional meets and get in touch with potential clients directly through Zoho forums, gaining some useful contacts in the process. Finally, if you stand out of the crowd and achieve significant success as an advisor, you can become the accountant of the month and get featured in Zoho’s monthly blogs, which can potentially broaden your client network even further. We have already touched upon some of the key features Zoho Books offers and now it is time to provide a more detailed view of the tools at your disposal. The basic features the software provides include invoicing, creating and sending estimates, time and expense tracking, reporting, bank reconciliation, projects and timesheets, managing workflows, bills, and inventory, handling purchase and sales orders, 1099 tracking and sales tax, and printing checks, as well as credit notes and vendor credits. It is worth noting that Zoho Books is a multi-currency, multi-lingual solution. As far as automation goes, you can make various processes simpler with recurring invoices, expenses, and bills and payment reminders. When it comes to managing documents, you can use the auto-scan feature that automatically scans receipts and converts them into expenses. Note that not all features are available with all plans. View the Plans & Pricing section of this Zoho Books review to get a better sense of what you get with each of the subscription plans at your disposal. As we mentioned previously, this company offers excellent webinars and training materials for accountants. However, it does not stop there but provides excellent resources for all of its users. If you are just getting started with Zoho Books, you can make use of the excellent welcome guide and plenty of help documentation that allows you to quickly get to know and successfully use all the features. If you are switching from some other accounting software, you can turn to the migration guide designed to simplify and speed up the transition process. Other useful resources include Zoho blogs, forums, essential business guides, and demo videos that allow you to see exactly how Zoho Books works. 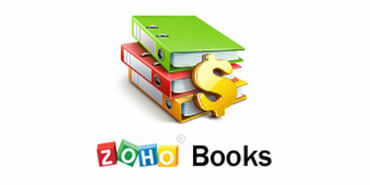 Zoho Books offers 3 subscription plans: Basic, Standard, and Professional. With the monthly subscription, the Basic plan costs $9 per month, the Standard plan costs $19 per month, and the Professional plan costs $29 per month. If you choose to subscribe for a year, you get 2 free months per year with each of the plans. All plans come with a 14-day free trial. Now, let us focus on the differences between the plans. The Basic plan is designed for 2 users (user plus accountant) and includes 50 contacts and 5 automated workflows. The features included are custom invoices, expense tracking, projects and timesheets, recurring transactions, and bank reconciliation. The Standard plan supports 3 users (2 users plus accountant), 500 contacts, and 10 automated workflows. It includes all the features available with the Basic plan, along with bills, vendor credits, and reporting tags. Finally, with the Professional plan, you can add 10 users and have an unlimited number of contacts and 10 automated workflows. In addition to the features available with the Standard plan, it offers purchase orders, sale orders, inventory tracking, and custom domain. Add-ons you can purchase include additional users (1 extra user equals $2 per month or $20 per year), snail mail credits ($1.50 per credit), and 50 auto-scans per month ($5 per month and $50 per year). Zoho Books collects your personal information upon registration and uses it for the purpose of providing services. It may share your information with its affiliates, resellers, service providers, and business partners that enable Zoho to provide its services to you. Before sharing your information with third parties for purposes other than providing services, Zoho requests your explicit consent. Your information is never sold to third parties and it is protected with advanced privacy and security measures. Zoho is ISO/IEC 27001:2013 certified and SOC 2 Type II compliant. It employs a variety of security measures, some of which include round-the-clock video monitoring and physical surveillance (private security guards) of data centers, biometric 2-factor authentication, servers kept in undisclosed locations, inside bullet-resistant walls, 256/128-bit encryption, intrusion detection and prevention systems, and automatic virus scanning. Thus, it is safe to say that your data is safe with Zoho. What users like most about Zoho Books is that it is highly functional, customizable, and easy to use. Plus, many users highlight its affordability, claiming it provides excellent value for your money. Complaints are rare and mostly focus on minor flaws, such as the potential need for even simpler form customization, the lack of possibility to add more contacts with the Basic plan, and limited report customization. Based on our experience and the experience of numerous Zoho Books users, there are only two greater flaws. Namely, the software does not provide the highly useful payroll and budget features. Zoho Books may not be the biggest name when it comes to accounting software, but it is definitely one of the best accounting solutions on the market. 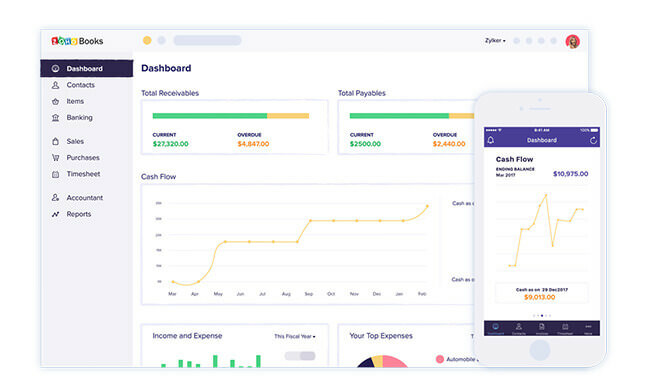 It does not only offer powerful tools that facilitate and automate financial tasks, but it is also easier to use than most accounting solutions out there and it is more than reasonably priced. It is highly functional and customizable and suitable for virtually any small business. It can also easily satisfy freelancers’ accounting needs. The lack of payroll integration is a serious shortcoming, but the company claims to be working on it. Once this important improvement is introduced, Zoho Books will go from being excellent to nearly perfect and we are honestly rooting for it. Our ratings are the result of an objective and independent evaluation of Zoho Books, generating the final rating that reflects the overall quality of the company. Ratings may change as the service changes. Zoho Books user rating based on 3 user reviews. Probably the best accounting software you can get for this kind of money, but I can’t understand why there is no budgeting option. Plus, I feel like they need another sub plan between Basic and Standard, the difference is two big, both feature-wise and money-wise. This is not the first accounting software I’ve used but it is the first I managed to use successfully. It is simple enough and offers all the necessary features, plus it’s cheap, so I’m happy I found it. Better than most, though user permissions need upgrading. There is no payroll integration, but payroll works lousily with all the accounting software I’ve tried, so I’m not too disappointed. We found 0 verified Zoho Books promo codes for April, 2019. There’s no Zoho Books coupons or discounts right now. If you like Zoho Books but aren’t sure whether they are truly the ideal choice for you, you may want to take a look at our comparisons below to discover if one of their competitors is more suitable for you.